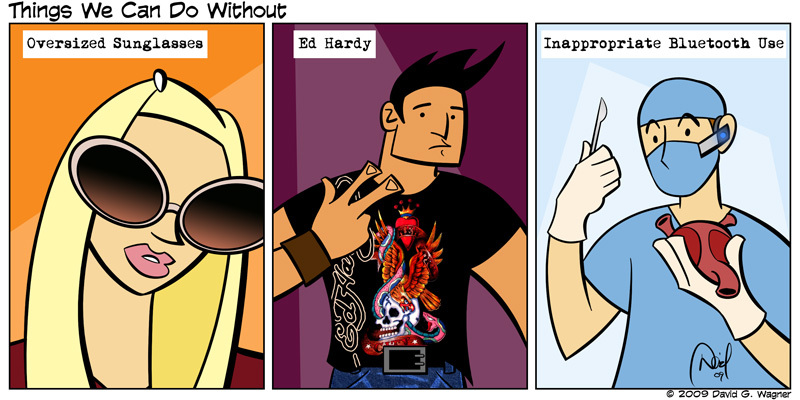 This strip was inspired by some things I’ve noticed while out in the “real world.” Women hiding their faces with oversized sunglasses, guys dressed to the 9’s with Ed Hardy gear and most importantly “Bluedouches.” These are people who use their Bluetooth without regard for anyone else in their vicinity. Ever been in line at a coffee shop and have someone yapping away when it’s their turn to order then they put up one finger as if to say “one minute?” Bluedouche. I think the glasses and clothes will just go away like any other fad but Bluetooth is here to stay. Ok, my griping is over.